INDIANAPOLIS (AP) Part-time drivers and one-off rides are usually afterthoughts at the Indianapolis 500, where the sport’s brightest stars tend to shine in the hot sun on the final Sunday of May. This year, the part-time driver is Helio Castroneves. 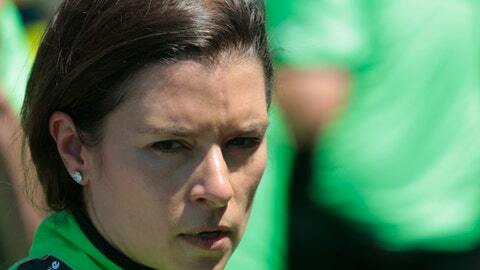 And the one-off is Danica Patrick. Throw in a deep, four-car stable from newly minted NASCAR Hall of Fame owner Roger Penske, the race favorite starting from the back row and a big name sitting out the race, and the 102nd edition of the ”Greatest Spectacle in Racing” has every expectation of living up to its nickname. Yes, Castroneves can win this race for a record-tying fourth time. He’s been chasing that mark since 2010 and has finished second three times, including last year when he was beaten by Takuma Sato, the first Japanese winner in race history. Castroneves will have Penske calling his race as ”The Captain” seeks his 17th Indy 500 victory. But this is so very different for the popular Brazilian. Penske needed him in sports cars this year so he moved Castroneves out of IndyCar but promised him a seat in the race for a shot at that fourth jug of milk. Castroneves is part of the talented Penske lineup that put all four of its Chevrolets in the front nine of the starting grid. He was the favorite to win the pole but didn’t get the run he needed and wound up eighth, right behind Patrick. Her return to racing’s biggest stage comes seven years after Patrick left for NASCAR. The only woman to lead laps in both the Indy 500 and the Daytona 500 has no plans to race again after Sunday. Like Castroneves, she returned to Indy with a car capable of winning. Chevrolet , winner of only two Indy 500s since its 2012 return to IndyCar, came to Indianapolis Motor Speedway intent on ending Honda’s two-year winning streak. With the fastest cars in the field, there are Chevys in seven of the first nine starting spots. Four went to Penske drivers and three to Ed Carpenter Racing, which is fielding a car for Patrick and put team owner Ed Carpenter on the pole. Everyone knows she can win her finale, but not many believe she will actually pull it off. Patrick believes in herself, though, and her peers have no doubt she will impress again at Indy. ”Not enough people give enough credit to her,” Castroneves said. ”She’s not only stayed away so many years from IndyCar, and come back, not only to be in a race … it shows that she’s an amazing talent. She opens so many doors for so many young ladies, young girls, to become race car drivers. Courageous for her, as well, making the decision to stop. Patrick briefly got on track Friday, the final day of practice, but had to take her car to the garage for an electrical issue. It might have caused another driver to panic, but not Patrick, who recognizes she has a shot to win. She’s nervous about the opportunity but excited about her future. She’s also mindful of what she’s meant to racing, those she has inspired and what her final trip around Indy will mean to those who have followed her career. The same could be said for James Hinchcliffe, the driver who replaced Patrick when she left for IndyCar and grew into one of the sport’s most popular drivers. He had a near-fatal accident at Indy in 2015, returned the next year and won the pole, then failed to qualify for Sunday’s race because of a series of mistakes by his race team. An embarrassing and heartbreaking setback for one of IndyCar’s championship contenders – and a driver with crossover appeal from his stint as runner-up on ”Dancing With The Stars” – Hinchcliffe did not want the field of 33 expanded to accommodate him. The Canadian was uncomfortable asking another driver to give up his seat for him, and he was determined to show strong sportsmanship during this setback in his strange history with Indy. So Hinchcliffe has honored every sponsor appearance, did a media tour to promote the race in New York City and has supported teammates as they’ve prepared to race without him. Even without Hinchcliffe, the race still has celebrity appeal. Alexander Rossi, winner of the 100th running, and Conor Daly start next to each other on the back row and were teammates on reality show ”The Amazing Race.” Rossi had a tire problem in qualifying that put him 32nd on the grid. Should he win, it would be a record – both Ray Harroun (1911) and Louis Meyer (1936) won the race from 28th. But anything is possible this year, including temperatures in the 90s that could make it the hottest Indy 500 in history. It will also be the final Indy 500 on ABC , ending the second partnership in sports and television history after its 54th running. The drivers aren’t sure what to predict and have no idea what kind of race it will be.